This is a mistake. The only sensible way to dispose of these options is for Treasury to set a floor price, and then hold an auction that permits anyone to buy any part – e.g., people could submit sealed bids and the highest price wins. In Treasury’s scheme, there is significant risk of implicit gift exchange with banks - good jobs/political support/other favors down the road – or even explicit corruption. For sure, there will be accusations that someone at Treasury was too close to this or that bidder. Why would Treasury’s leadership want to be involved in price setting in this fashion? ... In any crisis, technical mistakes are made due to high pressure, lack of information, and political considerations; this is unavoidable. But this proposed pricing for TARP warrants looks like a pure unforced error, and should be quietly overriden by the White House – hopefully, senior congressional leaders will quickly make this point behind the scenes. Treasury will begin publishing additional information on each warrant that is repurchased, including a bank’s initial and subsequent determinations of fair market value, if applicable. Following the completion of each repurchase, Treasury will also publish the independent valuation inputs used to assess the bank’s determination of fair market value. If an issuer chooses not to repurchase the warrants according to its existing contractual rights, Treasury has the discretion to dispose of the warrants as it sees fit over time. In these instances, Treasury will sell the warrants through an auction process over the next few months. This guy testifies in front of Congress as an "expert" on the financial crisis. Amazing. The BIS has released its always-excellent Annual Report, and it doesn't disappoint. 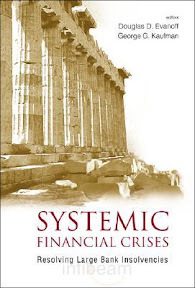 I highly recommend the Report's account of the financial panic last September and October (pp. 23-31). It's easy to forget how truly terrifying it was, and the unimaginable pressure that policymakers—especially the Federal Reserve—were under to solve new systemic threats pretty much every day. 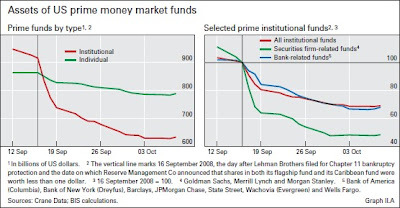 In particular, I recommend the box describing the crucial role of the money market funds in the financial contagion, and their role in spreading the funding crisis to the European banks (pp. 25-26). BIS publications always have great charts, and I've extracted some of my favorite charts from this year's Report below. 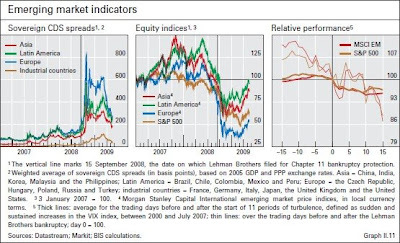 One interesting thing the Report does is it provides charts of all the important market indicators with a verticle line marking the date of the Lehman bankruptcy (Sept. 15). That way, you can really appreciate how important that day was. 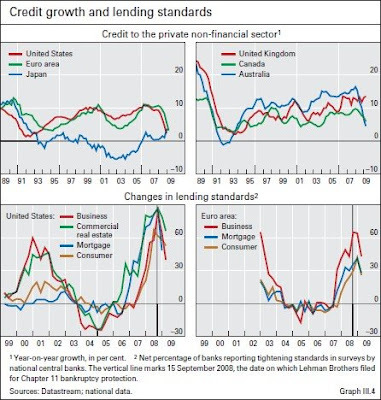 To say that it marked the beginning of a new stage in the financial crisis is a gross understatement. Other interesting charts in the Report: Great stuff, as always. Apparently commentators are upset because the administration's financial reform proposal only requires "standardized" derivatives to be cleared through central counterparties (CCPs), and not bespoke derivatives. James Kwak even questions "why we need customized derivatives in the first place." He claims he can't even think of an example of when a firm would legitimately need to use a bespoke derivative. Umm, how about something like portfolio default swaps? A portfolio default swap is a credit derivative that transfers a predetermined amount of credit risk on a reference portfolio. For example, a pension fund with a large corporate bond portfolio might decide that it needs to reduce its exposure to 40 specific bonds that have a total notional amount of $100bn. The pension fund could enter into a portfolio default swap with a dealer in which the dealer agrees to protect the pension fund against the first $20bn of default-related losses on the reference portfolio (the 40 identified bonds) over the next 5 years, in exchange for quarterly premiums from the pension fund. This kind of situation happens all the time, and it's perfectly legitimate for the pension fund to enter into the swap with the dealer. But portfolio default swaps can't be "standardized," because the reference portfolio in every swap is specific to the protection buyer. They're classic bespoke derivatives. Along the same lines, basket default swaps are also derivatives that can't be standardized. The most common basket default swap is a "first-to-default basket," in which payment is triggered by the first default—and only the first default—in a basket of identified bonds. Again, basket default swaps can't be standardized because the reference basket is specific to the protection buyer. Also, CDS on structured products (e.g., ABS) are, by definition, bespoke derivatives because the reference ABS are all different. 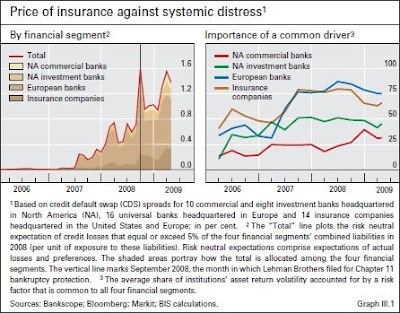 Yes, I know, CDS on CDOs are what brought down AIG, so some people think CDS on structured products are inherently evil. But that's not really a serious argument. The internet bubble brought down plenty of funds, but that doesn't mean stocks are inherently evil instruments. And anyway, the administration's proposal would impose conservative initial margin requirements on bespoke derivatives like CDS on structured products, which would prevent another institution from making a $400bn levered bet through OTC derivatives the way AIG did. I'm not even getting into classically bespoke derivatives like barriers (knock-in/knock-out options) or forward rate swaps, but suffice to say there are legitimate uses for all of these instruments. I should also note that what Kwak claims is a "terrible example" of when a firm would need to use a bespoke derivative is, in reality, a very good example. 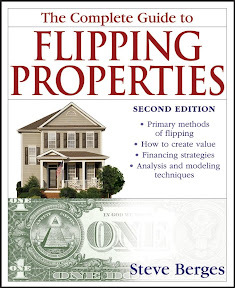 The example was a firm that needs to hedge a credit exposure in an odd amount of money, and Kwak says that's a terrible example because the firm would be "perfectly fine" with only being able to buy CDS in multiples of $10,000. Spoken like someone who hasn't managed money a day in his life. (I actually laughed out lout when I read that part.) I don't know a single corporate treasurer or portfolio manager who would be "perfectly fine" with that. Hedging in odd amounts of money is a very common—and perfectly legitimate—use of bespoke derivatives. Modeling the call is an interesting topic, as [cleanup] calls have historically not been exercised in an economically “ruthless” manner. Until now. Maybe Goodman just wanted a data point for her model. In fact, until proven otherwise, I'm going to assume that was the real reason Amherst put on the trades. Goodman wanted a slightly more robust model. Models strike again! 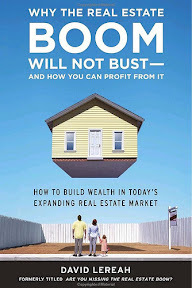 The market is so illiquid that there are no willing takers of risk currently so valuations are simply best guesses and there is no two way market in any sense of the term. ... There is no one dealer with more knowledge than the others or with a better deal flow of trades and all admit to "guesstimating" prices. To simplify greatly, the lower a dealer was pricing the reference CDOs, the more collateral it could demand from AIG. (And just in case you're confused by the terminology in the memo, a "CSA" is a Credit Support Annex, which is an annex to the ISDA Master Agreement, and governs collateral calls in CDS transactions.) 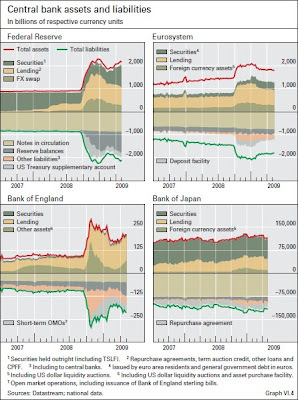 So how were the various dealers pricing the reference CDO bonds in November 2007? Not surprisingly, Goldman seems to have been pricing the reference CDOs in its trades more aggressively than the other dealers. [Add: I should also note that another way to put it is that Goldman was pricing the reference CDOs more "realistically" than the other dealers.] For example, the memo notes on page 7 that Goldman was pricing a deal called Independence V at 67.5 for purposes of collateral calls, whereas Merrill was pricing Independence V at 90. More broadly, Goldman's average price for its reference CDOs was 74; Merrill's average price was 83. The memo also notes that SocGen and Calyon both relied heavily on Goldman for pricing, which would explain why this Bloomberg article from Monday essentially accused Goldman and SocGen of killing AIG. What's also interesting (though not at all surprising I suppose) is how willing AIG was to play fast and loose with collateral thresholds. 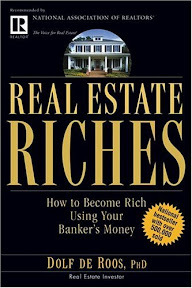 Thresholds are the amount by which the reference CDO has to decline in value before the protection seller is required to start posting collateral to compensate for price declines. A 10% threshold to the CSA means that the protection seller wouldn't be required to start posting collateral until the value of the reference CDO fell below 90%. 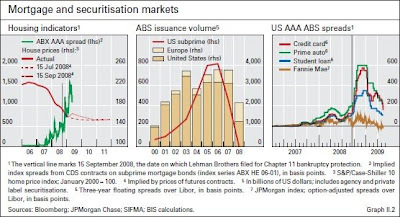 Given that AIG sold around $400bn of CDS protection (on net), you'd think that AIG would have insisted on high thresholds so that it wouldn't be exposed to mark-to-market risk on hundreds of billions worth of structured products at once. But no. According to the internal memo, several of AIG's CDS contracts (with multiple dealers) included no threshold to the CSA at all. The majority of its CDS contracts with Goldman, which was its biggest counterparty, had thresholds of only 4%. I guess I shouldn't be surprised anymore when I learn that AIGFP did something that stupid/reckless. But I still am. Floyd Norris praises the SEC for hiring University of Texas law professor Henry Hu. Norris likes this hire because Hu "was the first one [he] saw to point out that credit [default] swaps could be used to leave a creditor hoping that a company would go into bankruptcy." I sincerely hope that's not true (seeing as Norris is the NYT's chief financial correspondent), but I'm afraid it probably is. Apparently this is Hu's reputation—Felix Salmon calls him "the intellectual father of the CDS-help-cause-bankruptcies meme." Another academic who's evidently viewed as being prescient on the issue of CDS and restructurings is Stephen Lubben, who blogs at Credit Slips. Lubben has even referred to himself as "the professor that cried CDS." 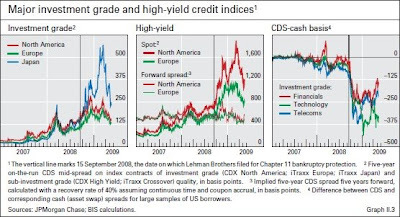 This is highly amusing because Professors Hu and Lubben each observed for the first time that CDS could make creditors less willing to agree to out-of-court restructurings in the summer of 2007, which was at least 5 years after the first time CDS actually did have this effect on a major restructuring. How either one of these professors can be considered "prescient" on this issue is beyond me. Academia truly is its own little world. People (and professors, apparently) seem to forget that CDS were around in the 2001 recession too. Clearly the blogosphere—as well as the NYT's chief financial correspondent—could benefit from a quick history lesson, so here goes. Off the top of my head, the first major restructuring that I can remember being significantly hindered by CDS was Marconi, and that was back in 2001-2002. Marconi was negotiating a restructuring with a bank syndicate, but for a long time certain syndicate participants (cough, UBS, cough cough) refused to agree to any restructuring that didn't constitute a "credit event" under the 1999 ISDA Credit Derivatives Definitions. The holdout banks had purchased CDS on Marconi to hedge their exposure, and if they were going to agree to a pretty drastic restructuring, they wanted to make sure they got the benefit of their hedges. After more than a year of restructuring negotiations, the banks agreed to a debt-for-equity swap that qualified as a credit event under most of the CDS contracts, but also pretty much wiped out shareholders. Mirant Corp.'s 2003 bankruptcy was also largely a result of CDS. Several creditors had purchased CDS protection on Mirant, and one major creditor in particular, which rhymes with Pitigroup, was relatively open about the fact that it didn't agree to a restructuring because it needed a bankruptcy filing to trigger its CDS contracts referencing Mirant. The bank that rhymes with Pitigroup's refusal to agree to a restructuring (which came at the last minute and was a big surprise, if I remember correctly) effectively torpedoed any chance Mirant had of avoiding bankruptcy. The Marconi and Mirant restructurings weren't minor events by any means, and they also weren't the only restructurings hindered by CDS (just the first two that popped into my head). The trade press was littered with articles in 2003-2004 about how CDS were hindering restructurings. The rapidly expanding market for credit derivatives threatens to make it more difficult and more costly to rescue companies that get into trouble, restructuring specialists have warned. This is because credit default swaps (CDSs), the most popular credit derivative, detach risk exposure from ownership and bring new and frequently inexperienced participants to the negotiating table. "They are raising problems because of the way they divide ownership from risk of loss," said Richard Nevins, a restructuring specialist at Jefferies, an investment bank. "They produce perverse incentives for creditors to frustrate a successful restructuring because they get more from failure." Some concerns have been expressed that the presence of credit derivatives will make restructurings more difficult, and there have been reports that problems have already arisen from time to time, but it has not been established how often they have arisen. The purpose of this booklet is to raise awareness of the potential impact of credit derivatives – in particular credit default swaps – on restructurings (including possible changes in behavioural dynamics resulting from positions in credit derivatives of participants around the restructuring table) and to provide a point of reference for those involved in restructurings facing situations where participants may hold such a position. 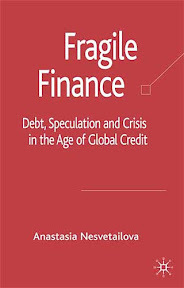 The INSOL report, which was well over a year in the making, was still published a year before Professors Hu and Lubben first observed that CDS could possibly change the incentives of creditors in restructuring negotiations. Given that history, it's fair to say that I'm less excited than Floyd Norris about the SEC's decision to hire Professor Hu. If the SEC wants real experts on staff, it should start trying to attract experienced market practitioners. Pure academics are much cheaper, of course, but pretty much everyone in the financial industry agrees that for the SEC to be an effective regulator, it has to start competing for talent. Marconi's case is a good example of the growing complexity of corporate workouts. 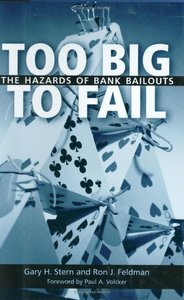 No longer is it only company executives and their bankers that sit round a table rescheduling loans. Others also have seats, including investors who bought loans and bonds at a discount, and those who have bought credit-default swaps—insurance against a company's going bust. The old, straightforward clash between a company and its creditors has been replaced by a mish-mash of interests. ... The holder of a credit default swap might prefer the company to go into bankruptcy. More complicated still, some around the table may be trading in and out of their positions each day, with their motives changing accordingly. Those leading the restructuring could only speculate about the motives of some people at the table. There was great uncertainty over whether credit-default swaps had been triggered (in fact, they never were) [ed: actually, yes, they were]. Some banks seemed keen for Marconi to die, which suggested that they had credit insurance. Meanwhile, workouts are getting no easier. Only this week a Swiss company was taken to the brink of bankruptcy by maverick bank behaviour: credit derivatives were the suspected cause. Remember, this article was published over 4 years before Hu and Lubben first started their "pioneering" work theorizing about CDS and restructuring/bankruptcy. This morning Bloomberg was reporting that today's $40bn auction of 2YR Treasury notes was expected to go well, and they weren't lying. The auction drew a yield of 1.15 percent (5 bps lower than the consensus estimate), and 2YR yields closed at 1.10 percent. Demand was also very strong—3.19 bid-to-cover—and that's probably the most important takeaway, given the scary weak demand at recent 10YR and (especially) 30YR auctions. Foreign central banks were big buyers today. A good start to this week's record $104bn in Treasury note auctions. Sorry for the lack of posting over the past couple of weeks. I've been insanely, mind-bogglingly busy recently. But things are starting to let up, so I plan to resume posting forthwith. [O]fficials said this week that Mr. Gensler [the CFTC chair] and Mary L. Schapiro, his counterpart at the S.E.C., had reached an informal understanding that would enable their respective agencies to share authority over the derivatives market. The term "OTC derivative" should be defined, and the CFTC should be given clear authority over all such instruments. To the extent that specific types of OTC derivatives might best be regulated by other regulatory agencies, care must be taken to avoid unnecessary duplication and overlap. Gensler's not-so-subtle attempt to give the CFTC default jurisdiction over all OTC derivatives suggests that Shad-Johnson 2 is far from finalized. It'll be interesting to see how this plays out. Well, interesting to me, at least. I don't plan to discuss Judge Sotomayor's nomination on a regular basis—debates over Supreme Court nominees are purely political, and have absolutely nothing to do with jurisprudence. I don't think it's possible to accurately predict what kind of Supreme Court justice a federal judge will be based on her record as a circuit and district judge. That said, I hope Judge Sotomayor is confirmed. She has always struck me as careful and willing to embrace complexity, which are two attributes I value very highly in judges. Plus, I'm excited about being able to say that I appeared before a Supreme Court justice twice back when she was a federal district judge. Remember when the stress tests had been "downgraded to irrelevance," and the PPIP was the only aspect of the Geithner plan that really mattered? Whoops. Turns out the stress tests were rather important, spurring the major banks to raise $65 billion in new capital in less than a month, with more capital raises on the way. And the PPIP? Well, the Legacy Securities Program is still on track to start purchases in July. But the PPIP's other half—the Legacy Loans Program—has already been downgraded to extinction. Ah, memories. New CFTC chair Gary Gensler provided a much more detailed description of the administration's OTC derivatives reform proposal on Thursday. While we still don't have nearly enough information to render judgment on the proposal, let me just say that I'm extremely impressed so far. The administration—by which I primarily mean Tim Geithner and Gensler—seems to be striking exactly the right balance. While they could still go off the rails on any number of unresolved issues, you get the sense that they understand the derivatives markets too well to make any calamitous mistakes. Obviously, a description of a new regulatory regime for OTC derivatives that's only 9 pages long is going to generate a lot of questions from the law firms. (I have a treatise on derivatives law and regulation that's over 2,000 pages long, so it's fair to say that Gensler's description leaves some things out.) On a first read, the one question that jumps out at me as the most important is how the CFTC plans to use the authority to impose initial margin requirements on off-exchange customized derivatives. Are they planning on reviewing every customized derivative prior to settlement to determine whether initial margin requirements are needed? In other words, will dealers be required to get a green light from the CFTC on initial margins before they can settle a customized trade? I highly doubt this is what the CFTC has in mind at this point, but when you consider the scheme the proposal sets up to make sure that derivatives that aren't cleared by a clearinghouse are truly "customized," things get a bit murkier. Presumably, off-clearinghouse derivatives can only be duplicated so many times before the CFTC deems them to be "standardized" and requires them to be traded through a clearinghouse. But if that's the case, then there would only be very limited circumstances in which the CFTC would ever impose initial margin requirements on a customized derivative—that is, unless they're planning on reviewing every customized derivative prior to settlement. Of course, that would likely be incredibly cumbersome, and could easily kill the bespoke market. Anyway, that's the question that really jumped off the page at me. Aren't you glad you don't do this for a living? Felix Salmon apparently thinks the SEC is "charged with regulating securities but not derivatives." Ezra Klein is quick to offer a me-too post, mocking the SEC for saying "derivatives" when it should have said "securities." Klein says that "[i]t's all the worse because the SEC doesn't have the authority to regulate derivatives, even though that appears to be what some of its employees think the agency is doing." Oy. The SEC does, in fact, have the authority to regulate derivatives. It regulates options (e.g., calls, puts, straddles) on individual securities, options on certain indexes of securities, such as the S&P 100, and exchange-traded options on foreign currency. Options are unquestionably derivatives. What Salmon and Klein probably meant was that the SEC doesn't have the authority to regulate swaps. 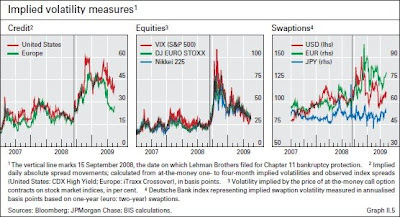 But swaps aren't the only kinds of derivatives by any means. Confusing swaps and derivatives is what leads idiot journalists* to constantly mislabel derivatives as "unregulated financial instruments." (If journalists think derivatives are all unregulated, then I'm curious what they think the Commodity Futures Trading Commission does?) * UPDATE: Felix Salmon has the grace to issue a mea culpa. Also, the last paragraph of my post is very poorly worded, so just to clarify, I didn't mean that Salmon and Ezra Klein are "idiot journalists." I've praised Salmon before, even suggesting that the New York Times immediately hire him as their financial reporter (after firing Gretchen Morgenson, of course, if only to post-humously vindicate Tanta). I'm sure he understands that not all derivatives are swaps, and that the entire purpose of the CFTC is to regulate certain types of derivatives. The "idiot journalists" I was referring to are the ones who wouldn't know a derivative from a dermatologist, but nevertheless describe derivatives as "unregulated financial instruments" in article after article. As you can probably imagine, that's frustrating for someone like me. Speaking of takedowns, don't miss ABS and MBS veteran Linda Lowell's long takedown of COP chair Elizabeth Warren over at HousingWire. Short version: Warren doesn't know the first thing about securitization markets, and it shows. So what is the disagreement? Prof Ferguson made three propositions: first, the recent rise in US government bond rates shows that the bond market is “quailing” before the government’s huge issuance; second, huge fiscal deficits are both unnecessary and counterproductive; and, finally, there is reason to fear an inflationary outcome. These are widely held views. Are they right? The first point is, on the evidence, wrong. The jump in bond rates is a desirable normalisation after a panic. Investors rushed into the dollar and government bonds. Now they are rushing out again. Welcome to the giddy world of financial markets. 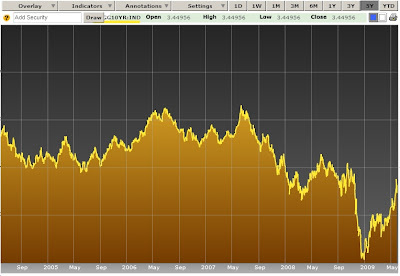 At the end of December 2008, US 10-year Treasury yields fell to the frighteningly low level of 2.1 per cent from close to 4 per cent in October (see chart). Partly as a result of this fall and partly because of a surprising rise in the yield on inflation-protected bonds (Tips), implied expected inflation reached a low of close to zero. The deflation scare had become all too real. What has happened is a sudden return to normality: after some turmoil, the yield on conventional US government bonds closed at 3.5 per cent last week, while the yield on Tips fell to 1.9 per cent. So expected inflation went to a level in keeping with Federal Reserve objectives, at close to 1.6 per cent. Much the same has happened in the UK, with a rise in expected inflation from a low of 1.3 per cent in March to 2.3 per cent. Fear of deflationary meltdown has gone. Hurrah! ... If inflation expectations are not worth worrying about, so far, what about the other concern caused by huge bond issuance: crowding out of private borrowers? 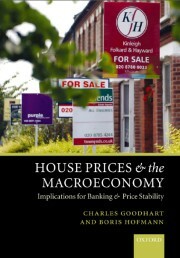 This would show itself in rising real interest rates. Again, the evidence is overwhelmingly to the contrary. The most recent yield on Tips is below 2 per cent, while that on UK index-linked securities is close to 1 per cent. Meanwhile, as confidence has grown, spreads between corporate bonds and Treasuries have fallen (see chart). One can also use estimates of expected inflation derived from government bonds to estimate real rates of interest on corporate bonds. These have also fallen sharply (see chart). While riskier bonds are yielding more than they were two years ago, they are yielding far less than in late 2008. This, too, is very good news indeed. Unexecuted confirmations in dealer portfolios aged more than 30 days have dropped from 97,650 outstanding in September, 2005, to 2,479 in March, 2009. Over the same time period, total monthly trade volume has increased from 130,004 to 408,472. 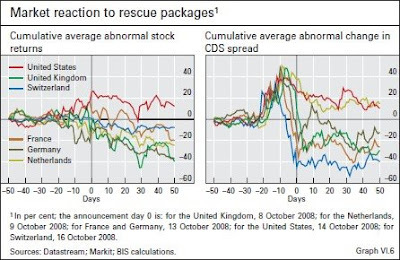 And did the CDS market freeze up in the aftermath of Lehman's failure? No. 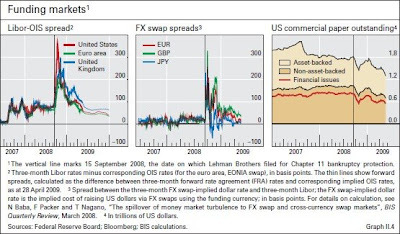 In fact, according to Fitch's CDS Market Liquidity Index, September 19th—the Friday of Lehman Week—was the most liquid day in the CDS market since the index started in March 2006.